The world is the way it is now because of five thousand years of ingrained structures of power based on darker times when things were much more violent and the only important thing was - could you and your kin jolt harder? But we don't act that way now. We can think and imagine ourselves differently once we understand what we've based our ideas on. Gender is a shell game. What is a man? Whatever a woman isn't. What is a woman? Whatever a man is not. Tap on it and it's hollow. Look under the shells: it's not there. 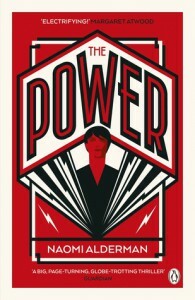 One of the most written-about books of 2017, and hailed as a modernised version of The Handmaid's Tale, I had very low expectations of The Power. I'm not a fan of dystopian fiction and I tend to avoid hyped-up books like the plague. However, I am a sucker for a great cover and so this ended up on my shelves. I loved the epistolary exchange between the two authors, Naomi and Neil, at the beginning and end of this book. I loved the idea that the rise of the women was not due to a freak accident or a mutation, but was based on a power that had been there all along but had been, for want of a better word, forgotten. I loved that Alderman based so much of her novel on current events. I loved that there were male characters that were not horrible human beings. Well, okay, there was just one. But ... that is still one more than in many of Atwood's books. I loved the snarky tone of Alderman's writing. Some of the dialogues and inner monologues was funny enough to make me smirk. Dripping with sarcasm, but it did make me smirk. Where the book fell flat, however, was that once the premise had been established, the story didn't seem to go anywhere. Or not anywhere new. It just seemed to follow the same old path of mayhem and carnage that had already been established by both the MaddAddam trilogy and Butler's Parable of the Sower. In fact, the insertion of Biblical tone and phrases reminded me a lot of Parable of the Sower, and the fight scenes reminded so much of MaddAddam that I spent the second half of the book wishing it would end. This had already been done, and done better. I really hoped that maybe, just maybe, this novel would have had the guts to dare to imagine the rebuilding of society after an apocalyptic event - the cataclysm in this book. There are hints of this at the end of this book, but the story ends before it gets to develop this aspect. All we get is another iteration of Lord Acton's adage that "Power tends to corrupt, and absolute power corrupts absolutely." So, while I really enjoyed the political side of this book that seeks to hold up a mirror to society with respect to the differential treatment of men and women, the execution of the actual story as a whole was disappointing.